From newborns to teenagers, when it comes to your kids, the most important thing is their safety. Accidents will happen, but the right furniture can limit or prevent many accidents all-together. Today, youth furniture is constructed and designed with your child's safety in mind; rigorously tested through third-party organizations in accordance with the Consumer Product Safety Commission's regulations. For extra peace of mind and to learn more about what to look for as you shop for beds, storage, and accessories for your child's bedroom, look at our helpful guide below. 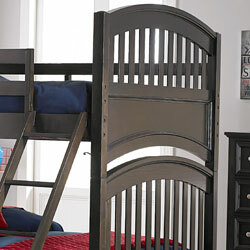 Rail Heights Beds with multiple rail height options allow you to adapt the bed to your child's needs. Make it easier for your little one to climb into bed with a lower rail height or create some extra underbed storage space for toys and games with a higher rail position. 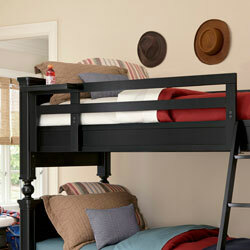 Metal Dowels A bunk bed can be a fun addition to your kids’ room, especially for whoever gets the top bunk. But you also want it to be safe. Beds constructed with metal pins instead of wood dowels to connect the top and bottom bunks are more secure and safer for your kids to use. Bolt-On Rails Kids like to jump on beds, and while it’s a lot of fun, it can put some wear on a bed. 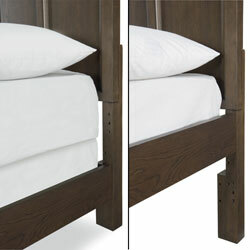 Look for beds with rails bolted to the headboard and footboard for a stable and durable connection. Entrapment Hazards Sometimes kids try to fit into small spaces and get stuck. This can be scary for both the child and parent. 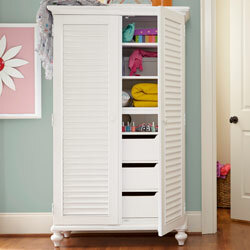 Furnish your child’s room with products that eliminate entrapment hazards. Smaller openings prevent kids from getting their arms and legs trapped. Kids will be safer and parents can be worry free. Adjustable Crib Heights Your baby is going to grow and grow fast; your crib should grow with them. Cribs with an adjustable mattress height will accommodate your growing baby as they begin to sit and stand, while also keeping them safe inside the rails. Anti-Tip Hardware With rambunctious playtime and climbing kids, it's natural for parents to worry about larger furniture falling and causing serious injury to their child. 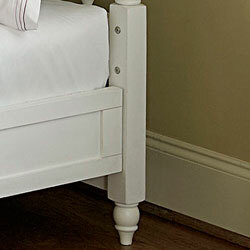 On items over 30" tall, look for included anti-tip hardware that lets you bolt the tall piece securely into the wall to prevent tipping and ease any fears. 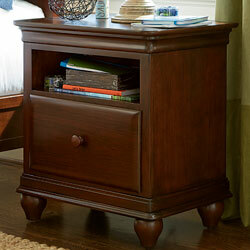 Drawer Stops Keep little toes and feet safe with automatic drawer stops. 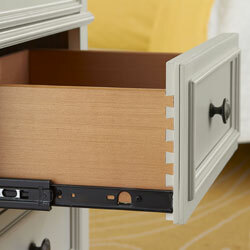 Drawer stops prevent drawers from falling out of a case, with strong metal guides that ensure hard or accidental pulling doesn't result in a crying or injured child. Softened Edges & Corners Accidents happen. Kids bump into furniture, trip and fall over toys, and sometimes roll out of bed. Luckily many youth furniture items are designed with rounded corners or softened edges, so that when accidents do happen, bumps and injuries are minimized. Lead-Free Finishes With children's disregard for what they put into their mouths and body, lead-free finishes for youth furniture is of huge importance. Finishes are now heavily regulated and tested by third-party organizations to ensure that any lead found in finishes is less than 90 parts per million. For parents, even the smallest percentage can be worrying, so look for youth furniture with completely lead-free finishes. Safety Certified All youth furniture is required to undergo testing for safety and construction. 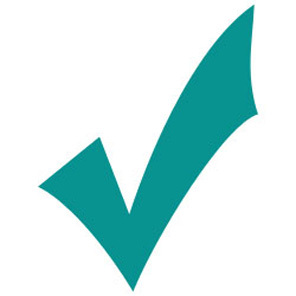 Ask a salesperson or check out the manufacturer's website for any youth piece you're interested in to learn more about that brand's voluntary and government-regulated third-party testing and certification.